Eight days later, Jesus came. After the joys and exuberance of Easter Sunday and Easter Week, we settle down into the longest Season in the Churchs Year - Eastertide. This period of fifty days is a time of sustained gladness, which comes through reading and reflecting on the Scriptures which describe the risen life of Jesus - not just his appearances to the disciples after the Resurrection, but the teachings from his ministry which reveal the risen life he now possesses. We also spend time hearing about how the Resurrection made a difference: how the timid and frightened disciples were able to leave <?xml:namespace prefix = st1 ns = "urn:schemas-microsoft-com:office:smarttags" />Jerusalem and proclaim a message of life over death to the whole world, as we read through the book of the Acts of the Apostles. We also linger over the first letter of Saint John, which ties together so many of the themes of Easter: life, faith, baptism, the Spirit - all brought together in the person of the Lord Jesus, risen from the dead. On this second Sunday, we continue to track through real time, by hearing what happened in Jerusalem on the Sunday after the Resurrection. with the Lord appearing to Thomas - strengthening his faith, and strengthening ours as we listen to the account. This is a very simple reading, but one that, for our congregations, can be very powerful. When the Church was young, it seems to have been a powerful community, where the virtues of selflessness and generosity were practised in the most complete way. Be sure not to let the simplicity of this reading disguise the powerful message. So first of all, take your time: there are three paragraphs - pause between each one, to allow the words to sink in. In the first paragraph, lean on the words no one and everything they owned. In the second paragraph, emphasise with great power - think about how this power would have shown itself in their lives and preaching. Finally, in the third paragraph, try to imagine this way of life in your own town or city - and if this creates a sense of wonder that they could do it, all the better! If you read with a sense of great wonder at this life of the young Christian Church, your listeners too will share a sense of wonder. The theme of this (much harder) reading is faith. We read it because this is the period of Mystagogy, a word which describe the ongoing catechesis that new Catholics receive at this time. They have been baptised and received into the Church, and now share our faith. We read Saint John to remind ourselves of what that faith is. These readings are printed in sense lines - which means you can pause at the end of each line. Understand this reading as more poetry than prose: dont try to read it as a story or logical narrative. It jumps around and sometimes leaves sentences hanging in the air. Present the reading as a mosaic of thoughts about faith and baptism. Be careful with the words begotten and begot - they are not too familiar nowadays. Also emphasise the question Who can overcome the world? and give people a chance to think of the answer. Above all, take your time, and allow the images and ideas to enter peoples minds. 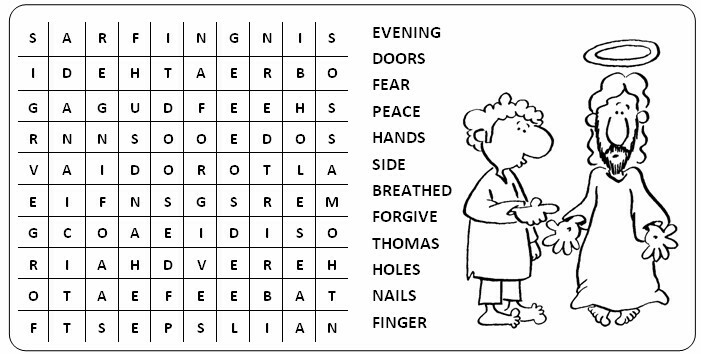 Click on the link to get this Easter Wordsearch. Feel free to copy and paste it into your parish publications.